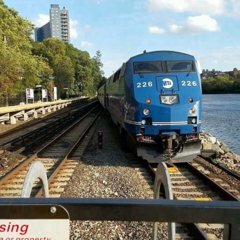 Congressman Max Rose joined with City Councilman Justin Brannan, State Senator Andrew Gounardes, and State Assemblywoman Mathylde Frontus in calling on the Metropolitan Transportation Authority to split the R-Train between Brooklyn and Manhattan, as was done following Hurricane Sandy from 2013 – 2014. The previous bifurcation of the R-Train resulted in more reliable and dependable commute times as commuters in South Brooklyn were no longer being impacted by delays in Queens. The MTA currently is not planning on any upgrades to the R-Train for more than a decade. Yeah I don't even think this merits a reply. This is definitely something that should be up for consideration, I don't know many riders using the line from Brooklyn to Queens (and vice versa) anyways. Why didn't we at least try something like this (not counting 2013-2014 Montague) years ago? Sorry what? We should split the instead of, you know, addressing the real problems of merges, speed, station ops, terminal ops, maintenance ops...? And let me clarify: there are reroutes I'd like to see done -- generally ones where there is a benefit not attainable operationally to be had. This doesn't even come close to being on that list. If we’re going to talk about train splits, then I’d prefer to run some Bankers Special type of Service (From 95th to Essex). - Astoria/FH to Whitehall (assuming that we don’t deinterline Queens in this scenario and that the Broadway Local tracks run at Max Capacity) Some Rush Hour Trains would run via Sea Beach for yard access, not to mention City Hall would have to open its lower level for part time access. This is definitely something that should be up for consideration, I don't know many riders using the line from Brooklyn to Queens (and vice versa) anyways. Why didn't we at least try something﻿﻿﻿﻿﻿﻿ like this (not counting 2013-2014 Montague) years ago? We did, it was the Bankers Special, it failed due to low ridership. Seems like another Wallyhorse thing is coming true. All hail the Wally. This version would begin and end at 95th Street with if necessary Chambers technically being the "northern terminal" with a maximum of 8 TPH, with such going northbound only (as to Manhattan it would be via the tunnel) stopping at Jay-Metrotech, Court, Broad, Fulton and Chambers (going back to Brooklyn, it would be via the Bridge and NOT skip DeKalb). Late Nights: The could run both ways via the tunnel and replace the on 4th Avenue, turning at Chambers Street so it stops at the "tunnel stations" in both directions as anyone needing Whitehall can do a same platform transfer to the or at that time at DeKalb, Jay-Metrotech or Court Street or take the to Bowling Green from Atlantic or Court or walk back from Broad Street on the as the south exit is very close to the north end of the Whitehall Station. If necessary, to accommodate such a new line, during peak hours you can have SELECT southbound only trains run via the tunnel with the and , which would actually give more service southbound to DeKalb as these trains would NOT skip DeKalb with it noted such trains are fully local in Manhattan and operate via the tunnel and NOT via the Bridge (obviously, the would not be needed to be split this way northbound since the new would operate via the tunnel). There probably would at first be minor confusion with the split southbound (but not northbound), but this looks to me to be the best way to appease pols concerning service. It’s so sad that this disaster of a service plan actually makes more sense than what the powers that be have proposed. Yes, it creates all sorts of unnecessary merges and slaughters bridge cap to achieve something (Nassau-4th local line) that could be done easily with Essex middle, but hey, at least it preserves tunnel service to Brooklyn. Problem with Essex Middle is that the need to use that because the comes in on the outer track there. Otherwise, that would make much more sense. Is there anything stopping us from moving the to the current track? No. That move is done solely for convenience in that if/when the and arrive at Essex simultaneously, they can both still platform. I’m willing to give that up. If that can be done, then yes, I would have this run to Essex at all times and possibly on weekends once the goes back to being weekdays only in Manhattan have this be combined with the and run to Metropolitan because otherwise you'd have both terminating at Essex (or have this operate to Essex at all times regardless and on weekends have the permanently run to 96th/2nd, something I could see upper east side residents want anyway and possibly 24/7). I'd like to say that this proposal is rather Interesting to say the very least, but it leaves a few unanswered Questions in my opinion. What happens to the 6th Avenue Express under the plan that you reconnect the Manhattan Bridge to the Nassau Loop? Wouldn't Chambers Street Need some sort of infrastructure upgrade in order to accommodate this New Service Change? Dude may not take the on the weekends. On weekdays, it's somewhat tolerable, but on weekends, forget it. That train has been useless to me multiple times because of the insane gaps in service. The Broadway Line would be as it is now (though likely during peak hours with some Brooklyn-bound (ONLY) trains shifted to the tunnel, running as full Broadway locals with the and to compensate for this new being a Nassau Loop) while the Nassau Line would ALSO be connected to the Bridge, but ONLY going towards Brooklyn (the Manhattan-bound track on the south side would NOT be affected and Broadway service to Manhattan would NOT change in this). The would ONLY use the Bridge going BACK to Brooklyn after going to Manhattan via the Tunnel (with the stops at Jay-Metrotech, Court, Broad, Fulton and Chambers ONLY served by northbound trains) that then become southbound north of Chambers back on the Bridge). Passengers at 95th, 86th, 77th, and Bay Ridge Av get off at 59th or 36th to take an express train to Manhattan, except for those traveling straight to Downtown Brooklyn and Lower Manhattan. And you do realize that virtually nobody rides an entire train/bus line from one end to the other, right? I use the 4 or so times a week. Trust me when I say I know how bad it is. But I think trying to fix that by cutting the line’s East River crossing is not just an acquiescence to operational incompetence, but is also a really dumb way of making the Brooklyn leg of the shorter. As I’m sure you all are tired of hearing me say, any conversation about routing changes needs to start with one about operations — whether or not just getting that side of the house together fixes the targeted problem, which here seems to be reliability. In this case, the answer to that question is, to an extent, yes, and I think that it’s mitigations that speak to that sort of issue that need to be the focus here. I’ve spent months here detailing specific strategies that I think could be helpful, so I won’t go into detail, but things like dwell control, terminal operation, scheduling, maintenance related operations and speed management seem pertinent to the . Some routing changes, though, address problems that transcend operation issues, and there are some operations issues that can’t be completely solved operationally. While this proposal’s stated raison d’être is operational, and I don’t think that it’s goal is unachievable operationally, I think there are absolutely route changes that could be made to the and related lines that would benefit service delivery/frequency. Examples of this would be Broadway deinterlining, Queens deinterlining, a Nassau-Bay Ridge service, etc. These aren’t far fetched ideas that take some sort of wizard to conceive; a glance at a track map and a service diagram would present the above solutions to a 6th grader with an attention span long enough to absorb the necessary information. What is required is merely care and creativity—elements that seem to have been lacking here. But let’s entertain for a second the possibility that all of this is totally wrong, and the electeds are completely correct in their belief that a shorter is the only way to make a better . Cutting the at Court achieves that goal, yes, but so does running the to Essex, a service pattern that would preserve Lower Manhattan connectivity. Could they not have gone for that pretty objectively better option? I’ll leave it to the forum to decide. Sorry, but the is DEFINITELY a problem. It's one of the least liked trains in Brooklyn, mainly for being "slow and old" in conventional terms. Even on the weekends trains aren't tolerable. Just this past Friday there was a 20-25 minute gap in service during RUSH hour due to some problem in Queens, forcing several trains to bypass 53, 45, Bay Ridge Av, and 77 on the local track. It has basically become the norm here. Oh yes, I love waiting 20-30 minutes for my trains. The only reason N/B is even tolerable for me is because of the fact that I go to 95 St and most of the time the s leave on schedule. S/B though? Forget it. As I’m sure you all are tired of hearing me say, any conversation about routing changes needs to start with one about operations — whether or not just getting that side of the house together fixes the targeted problem, which here seems to be reliability. In this case, the answer to that question is, to an extent, yes, and I think that it’s mitigations that speak to that sort of issue that need to be the focus here. I’ve spent months here detailing specific strategies that I think could be helpful, so I won’t go into detail, but things like dw﻿ell control, terminal operation, scheduling, maintenance related operations and speed management seem pertinent to the . Some routing changes, though, address problems that transcend operation issues, and there are some operations issues that can’t be completely solved operationally. While this proposal’s stated raison d’être is operational, and I don’t think that it’s goal is unachievable operationally, I think there are absolutely route changes that could be made to the and related lines that would benefit service delivery/frequency. Examples of this would be Broadway deinterlining, Queens deinterlining, a Nassau-Bay Ridge service, etc. These aren’t far fetched ideas that take some sort of wizard to conceive; a glance at a track map and a service diagram would highlight the issues that the above helps to mitigate. What is required is merely care and creativity—elements that seem to have been lacking here. Agree 100%. I don't know about all these proposals that everyone came up with, but we can definitely start with your ideas. I use the 5-7 days/week and it is not pretty. It's because of the unreliability of the that I even considered moving lol. You don’t have to tell me. I grew up in Southern Brooklyn and lived on Staten Island. Spent MANY nights at 59th street waiting 20-25 minutes for that damn train. Well the is such an afterthought, that I’m sure that those with other options won’t miss it that much if it were cut back. I personally do my best to not ride it. Sick of seeing those nasty cars from the 70s or whenver the hell they came out. Doors take FOREVER to close, then the hissing and long wait to take off. Everything is painfully slow about that line. One of the big things IMO that would improve service is NEW fleet. I felt the service ran better with the newer cars. I felt the service ran better with the newer cars. you can say that again. I deal with the sometimes in Queens. And I'm pretty sure that everyone knows here that on weekends, its Unbearable! 30 minute headways sounds like and is a joke to the average NYer! I try to avoid it whenever possible, but if I do feel like taking it, then I won't stay on it for long. Once, I had to take the from Cortlandt Street to 67th Avenue cause it was a direct route for where I needed to go at that time, I regret making that decision. Wasn't there a G.O sometime ago where the ran to Essex?